Contains 4 tubes of 12 Tablets: Blackberry Citrus, Blueberry Pomegranate, Ginger Lemonade & Tangerine Lime. Best before date shown in cart. Drink anytime for daily health and hydration. nuun vitamins hydrates better than water alone, so you can achieve your daily personal best. Each tablet makes one 16 oz. drink. Best before date shown in cart. New Formula. Contains 4 tubes of 10 tablets each: 1 Lemon Lime, 1 Citrus Fruit, 1 Orange and 1 Triberry. 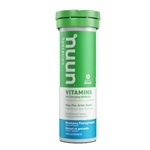 Nuun Energy (Boost) New Formula is designed to give you a lift and elevate your hydration. nuun energy contains caffeine from green tea extract, b-vitamins, and our signature blend of optimal electrolytes. Gluten-free & vegan. The new Nuun Active Hydration Tablets are designed to keep you hydrated wherever your active lifestyle takes you. nuun active is packed with optimal electrolytes, contains clean ingredients, and is low in calories and sugar. Gluten-free, vegan. Drink anytime for daily health and hydration. nuun vitamins hydrates better than water alone, so you can achieve your daily personal best. Each tablet makes one 16 oz. drink. New Formula. Contains 4 tubes of 10 tablets each: 1 Fruit Punch, 1 Strawberry Lemonade, 1 Tropical and 1 Grape. Includes 6 individual packets (18g each). Drink during intense or long workouts (>90 minutes) to stay hydrated and perform your best. 18g. Drink during intense or long workouts (>90 minutes) to stay hydrated and perform your best. 288g. Introduced in 2016, the Nuun Energy (Boost) New Formula is designed to give you a lift and elevate your hydration. nuun energy contains caffeine from green tea extract, b-vitamins, and our signature blend of optimal electrolytes. Gluten-free & vegan. 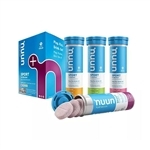 Includes 10 Nuun Tubes of 10 tablets each.